It's the 100th challenge over at The Play Date Cafe - whoo hoo! We've got earthy, fall colors for you this week - terracotta, sunflower, and olive. Our fabulous sponsor is the ultra-adorable Lawn Fawn! Each DT member got to pick a fun set to play with and I chose My Silly Valentine. I totally love it! I was going for the look of a textured kitchen tablecloth, complete with fringe, and a pie stand on the table. Did I do okay? I used Stampin' Up! 's Ornament Punch to create the base of the pie stand. I am in love with this little pie! I colored him with Copic markers, then applied SU's Crystal Effects for a pie that looks straight out of the oven. I drew a shadow under the scallops and along the base of the pie stand with a Versamarker, a tool I haven't used for quite some time. Let these fall colors inspire you, and link up your creations in the gallery at The Play Date Cafe. Can't wait to see them! Too too cute! Love your tabletop scene! Fabulous card Colleen, what a sweet little pie! I love these autumnal colours, and I will certainly be joining is again this week! Now, where's my thinking cap...? Your earlier post gave me a lump in my throat but this one really made me chuckle. 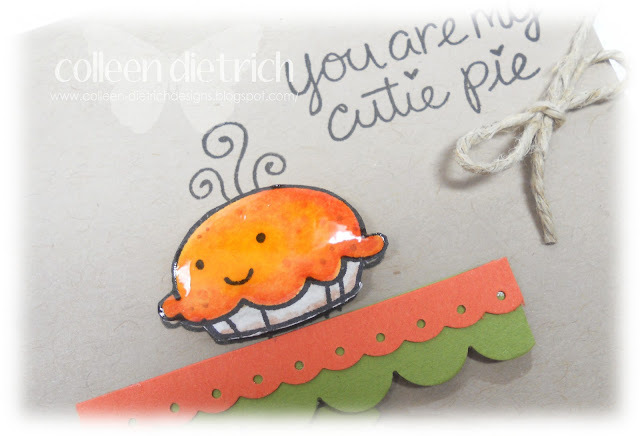 How cute is this :P Love the crystal effects on the pie. Lovely touch with the twine. Did you do OK? Are you crazy?? This is MORE than just OK!! Oh my word, this is terrific!! I love how you built your textured tablecloth and that creative pie stand. And your cutie pie looks so real!!! Great work on this fun card, Colleen. I LOVE it! Adorable Colleen! The tablecloth and pie stand are great! Very creative! This is so cute, Colleen! The tablecoth is so clever! And the pie is just adorable! Completely adorable and so very creative!!! Colleen, this is so cute. I love it. How cute is this.. Adorable. I love it!! aww so so so very cute! LOVE your pie stand!! Super cute card! 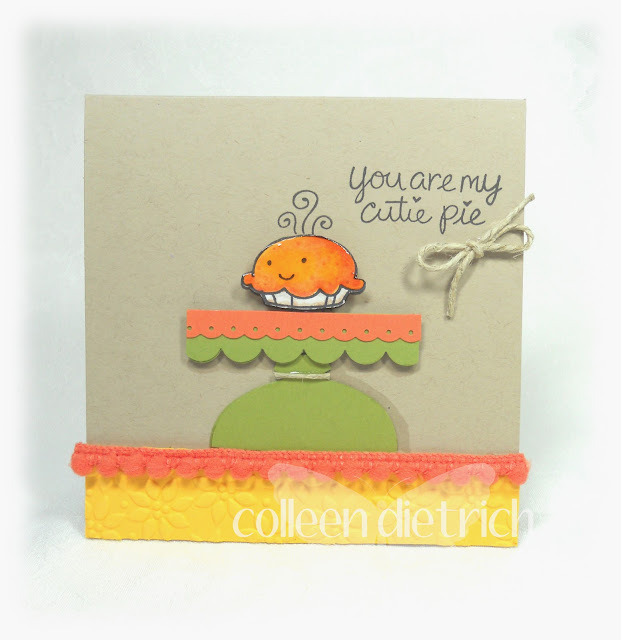 Such a sweet fun card from you this week Colleen - love your pie! This could not be any cuter. I LoVE the cake stand! Super cute, cute, CUTE! LOVE that little table! Too too cute for words!! !